Heat Roadmap Europe 3 consisted of a study conducted on the work package 2 of the STRATEGO project. 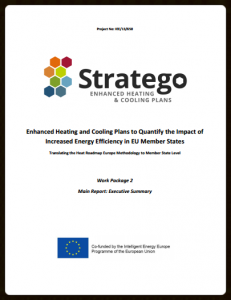 The overall aim in STRATEGO WP2 was to develop low-carbon heating and cooling strategies, which are called Heat Roadmaps, and subsequently to quantify the impact of implementing them at a national level for five EU Member States, which are Czech Republic, Croatia, Italy, Romania, and the United Kingdom. These countries vary considerably in terms of population, climate, resources, and energy supply, so the key results, conclusions, and recommendations presented in this report can inform national energy policy across all of Europe. HRE3/Stratego started by creating national energy models, including hourly profiles. Using geographical mapping, the demand and supply potential for heating and cooling was mapped. By including the cost of energy savings, a reasonable heating and cooling demand in 2050 was determined. Using this (geographic) demand data, the potential for district heating and cooling was quantified. By quantifying available excess heat and estimating available renewable resources, the renewable heat resources in Europe were mapped. This was used to model the energy system on EnergyPLAN, allowing for an analysis of the efficiency, renewability, and cost of a system with integrated heating and cooling demands. The overall conclusion is that a combination of energy efficiency measures, in the form of heat savings, district heating in the urban areas, and heat pumps in the rural areas, reduces the energy system costs, energy demand, and carbon dioxide emissions in all five STRATEGO countries for the year 2050 compared to a ‘Business-As-Usual’ projection. A reduction in cost by 15% of the energy system (35 billion every year in the 5 Stratego countries) can be achieved by investing in energy savings, district heating and heat pumps. Energy demand is reduced by over 1000 TWh/year if the Heat Roadmap scenarios are implemented in all five STRATEGO countries. The combined reductions in carbon dioxide emissions, 275 Mt/year, is more than all of the carbon dioxide emissions emitted from the Czech Republic, Croatia, and Romania today. The EnergyPLAN model was used in the STRATEGO project to create hourly energy systems models for each country for the year 2050, which include electricity, heat, cooling, industry, and transport. The links below are for the reports with the results for each STRATEGO country, but models are also available for download here. Factsheets are available for Croatia, Czech Republic, Romania, Italy, and the United Kingdom.